As we gathered up the tools, rain splattered the tarp, stretched tightly across the tools on the Haley’s farm truck. Rain doused the orange flames, which sizzled and popped among the remaining embers of the burn pile. Rain drenched like a cleansing shower as I took a day’s end look at the cemetery, now free from overgrowing brush and fallen logs—free and vulnerable and ready for this work of honoring and healing. 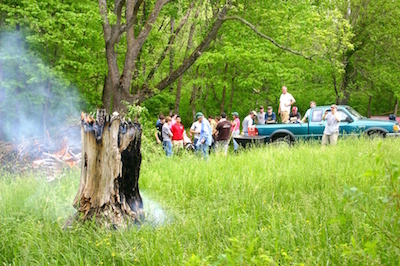 Saturday, May 16, 2015, ended with rain, but it began with contemplative hard work as approximately 25 members of the community, students and teachers of the Stonewall Jackson High School History Club, participants of the Corhaven’s Men’s Retreat, and gardeners of the Northern Shenandoah Valley Master Gardener Association met for the first day of clearing invasive vegetation from the “Sam Moore Slave Cemetery” at Corhaven. We nipped away old fencing, sawed down young trees, pulled weeds, removed fallen logs and branches, and revealed more graves, more depressions and flagstones, tripling the size of the known area. It was a day filled with sweat and tears. It was also a day filled with awe. While American justice failed the men and women buried in the slave cemetery during their lifetimes, Virginia law (§18.2-127) now protects any and all cemeteries from harm. After prayer and division of labor, we all attended to our work in tandem, lending helping hands as they were needed and being mindful of treading respectfully among the resting places of these beloved children of God. People of such varying ages and walks of life came together in a way only God can manage to network. In several back-tingling, burning-bush moments, everyone felt God’s Spirit moving among us: in the presence of Star of Bethlehem (a perennial bulb that derives from places in Europe and Africa), in finding even more unknown-to-us depressions and fieldstones that marked burials hidden by brush, and in the spontaneous combustion of a thick old tree stump well away from the burn pile—a stump that suddenly popped into flame during passionate reflection on our work that day. It was like something was being released. There is still much to do. As we research primary historical resources, converse with members of the community that might be connected with the site in some way, and engage archaeologists in mapping and documenting the site, we’ll hold May 16 close at heart. The day couldn’t have gone better. Please pray for God’s guidance and grace as we work together toward the goal of honoring those buried in the cemetery and providing a place of reconciliation and healing in the community. Sarah E.N, Kohrs is the coordinator for the restoration of the Sam Moore Slave Cemetery at Corhaven, the retreat center in Quicksburg VA . She creates written and visual art, including poetry, pottery, and photography, that seeks a unique perspective on how surroundings kindle hope in even a disparaged heart. Her work has been published in From the Depths and Virginia Literary Journal. She lives in Mt. Jackson, VA.